This is going to hurt Intel's memory business's profitability -- in the short-term. Back in July, microprocessor giant Intel (NASDAQ:INTC) and memory specialist Micron (NASDAQ:MU) announced that they planned to part ways in the development of future versions of a memory technology called 3D XPoint. 3D XPoint features nonvolatile memory, that is, memory that retains the information that's written to it even when it doesn't have power. It promises superior performance and endurance over more common NAND flash memory, albeit at a higher price. Both companies have indicated that they intend to continue the development of future versions of 3D XPoint, but they'll be working entirely separately now rather than pooling their resources. On Oct. 18, Micron also announced that it would be exercising its call option on Intel's stake in their memory joint venture, called IM Flash Technologies. Intel had previously told investors to expect that its memory business, formally called its nonvolatile memory solutions group, or NSG for short, would be profitable for the entirety of 2018. However, on the company's Oct. 25 earnings call, Intel interim CEO and CFO Bob Swan updated that outlook, stating that, "as a result of pursuing 3D XPoint development independently and a tougher NAND pricing environment, we now expect NSG to be approximately breakeven for the full year." While it's straightforward to understand why falling NAND flash prices would hinder Intel's memory profitability goals, the effect of the breakup with Micron on profitability might be a little less clear. Let's take a closer look. Manufacturing memory chips -- whether they're NAND flash, DRAM, or 3D XPoint -- is something that's highly research-and-development-intensive. 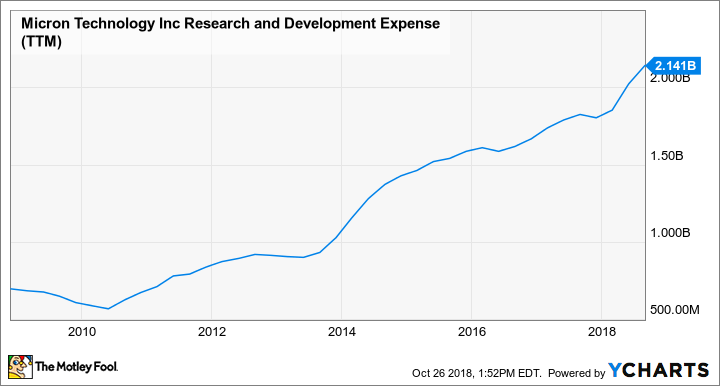 As you can see, Micron's investments in R&D, admittedly to support a broader set of memory technologies than Intel needs to invest in, have been steadily on the rise. When Intel and Micron were working together, the companies shared the burden of figuring out how to build those chips, which presumably meant that the total cost of maintaining the research and development pipeline was divvied up between them. Now, each organization is going to need to take on that full research and development burden. It's little wonder, then, that the profitability of Intel's memory business is set to come under pressure due to this split. Intel has been quite vocal about how important 3D XPoint memory technology is to its business over the long term. Not only is it important for NSG -- which, in addition to its NAND flash products, sells storage drives based on 3D XPoint -- but it's also something that matters to the company's large and fast-growing data center group (DCG). One of the key features of Intel's next-generation server processor, called Cascade Lake, is that it will support memory modules based on 3D XPoint, called Optane DC Persistent Memory. During the company's third-quarter earnings call, Swan said that Intel "shipped [its] first revenue units of Optane DC Persistent Memory to Google, Microsoft, and Alibaba, and we're already receiving great feedback." At the company's investor meeting back in February 2017, then-DCG chief Diane Bryant showed a slide indicating that by 2021, the served addressable market for Optane DC Persistent Memory products would work out to roughly $8 billion. Revenue from Optane DC Persistent Memory falls under the DCG unit, rather than NSG. Between the opportunities for 3D XPoint in the storage market as well its potential to replace DRAM in some data center applications, I'd say that the chip giant's investments in 3D XPoint technology have a good shot to pay off over the long term, even if it must spend more to develop the technology following its split with Micron.